Developer Assistant is a plug-in for the FileMaker® Pro database that helps FileMaker developers save time and be more productive. 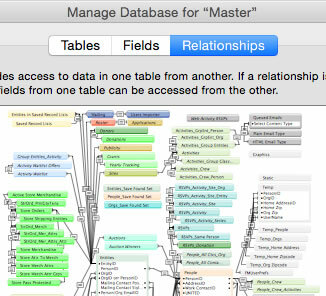 Developer Assistant Standard Edition lets you search in scripts, the Tables, Fields, and Relationships tabs of Manage Database, and in any multi-line text box or multi-line list in any FileMaker dialog. 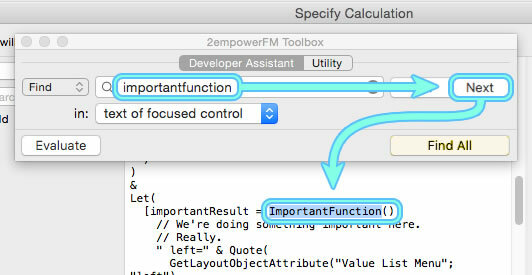 You can also highlight and instantly evaluate calculations in running scripts, and more. Developer Assistant Advanced Edition is an optional upgrade that adds the ability to replace text in scripts and multi-line text boxes, get a list of all matches, and replace chosen matches in that list. Supports FileMaker 14's new Script Workspace. Largely rewritten internally for faster searches and future expandability. You can now find a previous match instead of just a next match. Option to match "Contains", "Starts With", "Ends With", or "Whole Words". Option to toggle if the search window remains always on top of other windows. Find disabled script steps and more by optionally searching in the underlying XML that represents each script step. Default script search is now performed on a translation of the XML representing each of FM's 167 unique script steps into a string that matches exactly what you see in the script editor. The search also includes metadata from the XML that's not visible in the script editor. The previous Developer Assistant only performed minimal translation of XML before searching which made it difficult to search for anything too long or complicated. Default script search now includes the name of the script along with the script steps. Option to display the exact text that was searched, making it easy to come up with additional searches for more specific XML or hidden metadata that you don't see in the script editor. Find tables in a maze of relationships. 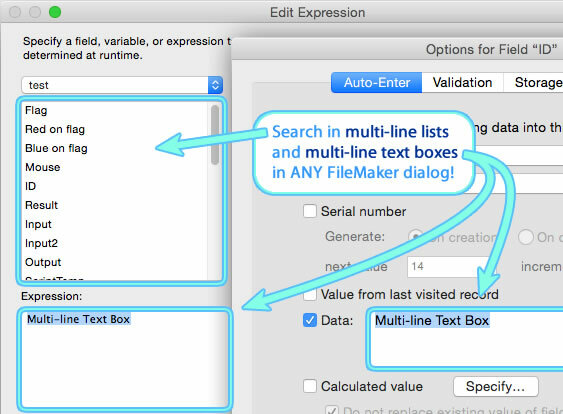 FileMaker uses multi-line lists to show names of functions, names of layouts, watched expressions, script steps, fields being imported/exported, and many other things. A list search includes all visible text in all columns of multi-line lists. In FileMaker Pro Advanced, when you search in the Tables or Fields tab of the Manage Database window, a special search mode will also find text associated with the tables or fields, such as field auto-enter and validation calculations. The "Multi-line Text Box" text in the lower right of the image above is one such auto-enter calculation that would be found by your search in the Fields tab. A search option lets you search with Perl-compatible regular expressions. These expressions can be used like wildcards, so searching for the regular expression "Make. *" would find "MakeWidget()", "MakeGadget()", and so on. Replace in Scripts. Yes, we said Replace in Scripts. Okay, so you can only replace text in the XML representation of script steps (the text in the blue box above), and that makes things more tricky, but if you're up for the challenge, the manual will walk you through the process. And c'mon, replace in scripts! Replacements let you quickly refactor your database by renaming $variables, SQL references, text-based parameters, product names, and anything else FileMaker can't rename for you. Paste script steps or calculations from another DB, then rename all the broken references so they work in the current DB. You can even add or remove a parameter in all calls to a function or swap day and month in all dates. Use your imagination! Replacements are powerful and will save the advanced developer a lot of time. Yes, we know all too well that you can cut your text out of FileMaker and run replacements in an external text editor, but it's time to stop wasting time with that and time to stop risking the loss of your work when you copy the wrong piece of the calculation back or edit the wrong buffer. Double click any match to bring it up. Matches can be brought up even if you move the thing they refer to. 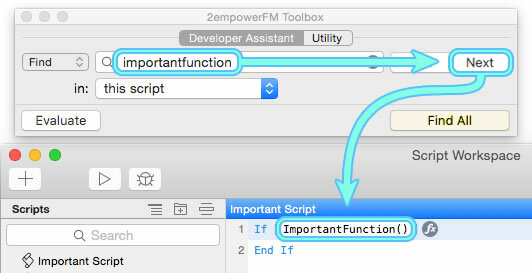 Yes, Developer Assistant Advanced turns FileMaker into a refactoring paradise. Evaluate selected text in place. Or, say a script isn't working. You might turn on FileMaker's Script Debugger and run the script line by line, but how do you tell when a calculation on a line isn't evaluating correctly? 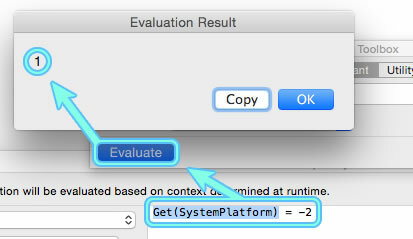 If you're stuck with only FileMaker's Data Viewer, it's a real pain to copy a part of the calculation, close the Specify Calculation dialog, possibly close the parent of the Specify Calculation dialog to unlock the Data Viewer, then add a new expression to the Watch tab of Data Viewer, paste what you copied, then finally click Evaluate Now. Then you have to open your original calculation again and find where you were, possibly copying another piece of the calculation and doing the whole thing again. Madness! Instead, just highlight the part of the calculation you want to evaluate and click Developer Assistant's Evaluate button. That's it. It saves a ton of time. We know - we used it constantly back before we got all plug-in focused. 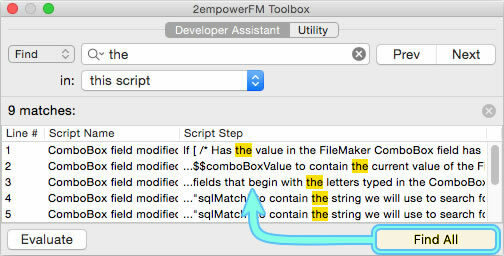 FileMaker uses lists of fields, script steps, and so on where each line is prefixed by a double arrow (at least in some dialogs and in older FileMaker versions) indicating the line can be dragged up and down. Macintosh FileMaker allows you to select more than one line and drag them up or down together. Newer Windows versions of FileMaker allow the same thing, but only in some places. Moving groups of lines can save a lot of time in larger databases when you want to organize many fields or change the order they are exported in. It can be exceptionally frustrating for those used to Windows keys to reflexively hit the Home key on a Macintosh and have the text view scroll all the way to the top instead of moving the text-entry cursor to the start of the current line. The same goes for those used to Mac keys who sometimes use Windows. 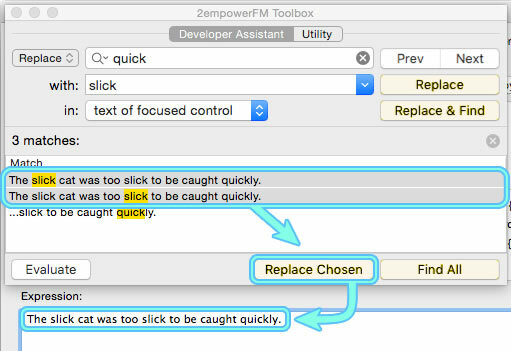 Developer Assistant Standard fixes these problems by allowing you to remap the Home, End, Shift-Home, and Shift-End keyboard combinations on Macintosh to work like they do on Windows, or to remap the same keys on Windows to work like they do on Macintosh. Even FileMaker, Inc. has purchased multiple licenses of this tool. Now you can try Developer Assistant and Developer Assistant Advanced free for 30 days. Simply click the Macintosh or Windows download link below to get a trial of both plug-ins in one download. For FM 18 support, you must use the Beta version. The beta is a free update for users with a license purchased April 1st, 2018 and later. Latest version is 3.4 Beta. I use this plugin all the time. I consider it one of the indispensable tools I use when programming with Filemaker Pro. Can't live without it.